Hello and welcome to the CardMaker Magazine/The Stamps of Life Blog Hop. You should have arrived here from Kristine Reynolds blog, but if you find a broken link along the way, you can always return to CardMaker Magazine Blog for the full hop list. This was actually my first introduction to The Stamps of Life and I LOVE the quality of the stamps. They have a wide arrange of stamps from trendy to flowers to cutesy. I absolutely love this Crayon2stamp set. Tickled Pink, Green with envy, Blue without you. This stamp set is a must have for lots of occasions. This little cutie is stamped with Tiles2stamp. So many fun things you can do with this set. Along with the "tiles", this set also includes a couple of greetings and adorable backgrounds sized perfectly for the rectangles. The Stamps of Life are generously hosting a giveaway of three stamp sets ($12.95 value or less) to one winner, so be sure to comment on each stop along the way! Imagine Crafts/Tsukineko: Memento Luxe inks Rose Bud, Angel Pink, Rhubarb Stalk & Lilac Posies. Watermark ink, White embossing powder. Encore Metallic Copper ink. Wonderful cards, Penny! I'm crazy for that Tiles2Stamp card. Great design and stamp set! Crayons hold a special place in my heart too - when I was little my favorite gift was ones of those boxes of 64 Crayola crayons with the metallics inside and the sharpener in the back. I like that crayon image as well and all the fun 'colorful' sayings that accompany it. I don't have any SOL sets in my collections yet, but when I do, this set will be among the first I order! As a math teacher, I really like the geometric feel of your thank you card as well. I love the layout of your card -- so beautiful! Thanks! The crayon set is such a great one! I am inspired to get mine out and create! Such a cool card - and with crayons - the colors are endless! I love that stamp set. That is one that is on my list. Your card is great! Cute cards. Love the tile card. Great idea on a different way to use the crayon set! GREAT Card love how you used the crayons. I love the stamp set as I have always loved to color! I love the crayon card! I can think of so many ideas! Will be on my next order to SOL!!! love both of these cards! the crayons are great for kids' cards and i like the addition sentiments that go with the set! the tile card would be good for masculine cards! good one to send for owh! I really love the way you used the tile stamp. Beautiful! Loved the way you hung half crayons on the card. Clever! Great idea, love the colors !!! Lots of pretty details in the crayon card and the tile card is sharp and interesting! I adore these cards! Very creative. Love the crayon set and haven't seen the tile set before-enjoyed both creations-thanks. thanks for showing the tiles it really helps to see them and the crayons cute cards. Love the bronze card and the crayon stamp set is one of my favorites! Both of these cards are SO fabulous!! You did an amazing job with both!! That crayon stamp set looks like one I just might HAVE to have!! I love Crayons!!! Great job!! Great use of crayons for banners. Very inventive. Cute. Always like new ideas for crayon stamps. 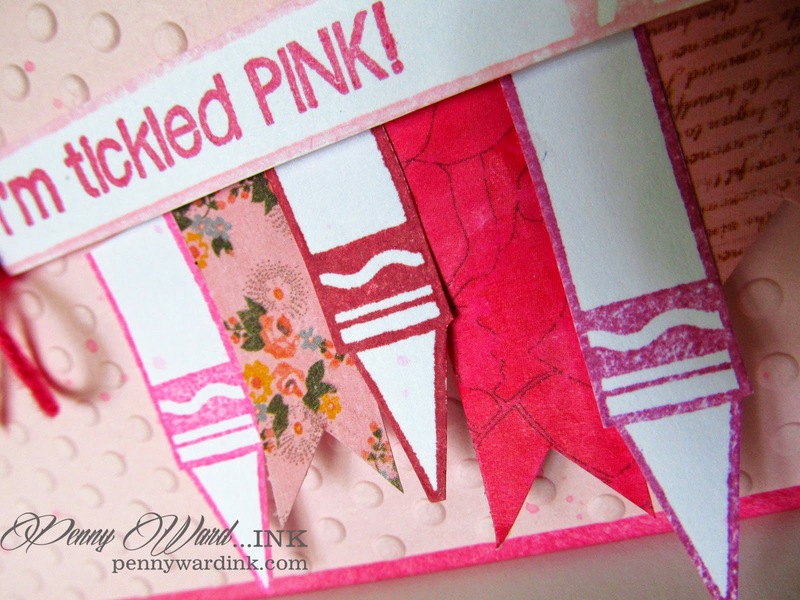 Who would have thought to combine crayon stamps and banner dies. .. . Awesome cards, Penny! The crayons are so much fun! I really like that you used the crayons as banners! Super cute! Love the crayons and banners! Both cards are terrific. Like how you used the crayons. Lovely cards. Thanks for the details using each stamp set. Love the crayons as banners - so clever! i have had the stamps2tile on my list for a while now, I think your card just moved it up to the get now category ha ha! The ribbon on the tile card really makes it pop! Cute way to use the crayon -- in the ribbon. Your cards are beautiful. I just discovered Stamps of Life and am HOOKED! I love both of these cards. Love the way you used the crayons as part of the banners! I have not seen any of the Stamps of Life yet, but these look like so much fun! You did a great job! Great ideas. I'm a huge crayon lover. There are such great sentiments to go with them and make wonderful kids' cards. What great versatility--I love how you showed two great cards in different styles! These are two of my favorite stamp sets...they are so easy to work with! And you did a great job, too! the crayon card is darling and I absolutely love the tiles2 stamp card. What a great job you did. I love how you included the patterned tiles and made them pop. Fantastic cards! Each one is so pretty! Thanks for sharing! Hi Penny. Two lovely cards. I love the crayon stamps especially. Take care. I like both cards but the Tiles Stamp one is really original. I do like this crayon set...it has some cute sayings. Thanks, Penny. Great cards! I really like how you placed the crayons in the first card. Great idea! the crayon card is so cute! Love the crayons used as part of the banner. So cute. Love your card. All your cards are great! Love the way you used the crayons as part of the banner. Nice idea. Beautiful cards. Love cards. I especially love the crayons. Makes me want to go color. Thanks for such great ideas. Wow! Love these thank yous! Have both of those sets. Thanks for new ideas. Both are so very cute! Thank you for sharing these great card ideas!! the banners out of the crayon stamp are very cool! I just picked up this set and this gives me some good ideas. the tiles card is a great one to make for guys - I'm always on the look out for those types! I love TSOL & have been a die hard club menstrual for several months. I've looked at the crayons set & wondered if I'd ever use it. I love the way you turned the crayons into banners so I know is going into my wish list. Thank you for sharing & inspiring! Tiles2stamp is a wonderful "go to" set for just about any occasions. Thanks for sharing your cards with us. Very cute cards, love the design and the colors. I have the crayon stamp set and dies, and people go crazy when you make a card with them. SUCH FUN! Really like you inventive designs. LOVE the Stamps of Life! Love the cards. The crayons are great. I love the brown card. Very different and very beautiful. What fun cards! I love the pink and the crayons in the first card and the awesome geometrics on the second card! I love the way you used the crayons. Coloring was a favorite pastime for my daughter and myself as she was growing up (like so many). Going to make her a card. This is such a great design using the cute crayon stamps. Love your card!! It rocks!!! Love both cards, especially the pink one! great way to use your stamps. Love the crayon banner. Love the pink idea a friend of mine has been invited to a party where pink is the theme this idea would work well love it!! !